The Handmaid's Tale begins in Margaret Atwood's typically understated style. We begin in the middle, and slowly the past and the present unfold like the drawing back of curtain to reveal the complete diarama. 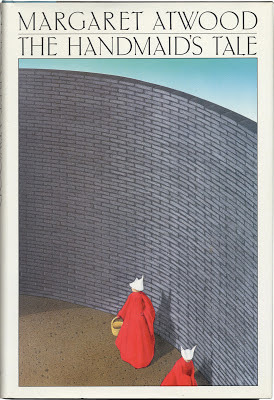 This is the story of one woman in a society that has recently transitioned very quickly from the contemporary American reality of 1985 (the publication year of the text) into a totalitarian regime now called Gilead. The narrator, unnamed at the beginning of the story, has been forced into the role of handmaid, or surrogate child-bearer, for a high-ranking Commander and his wife. The position of a handmaid in a household in Gilead is ambiguous. For, although these women fill an essential role because of the declining fertility rates, they are scorned members of society. The narrator cautiously makes her way through each day, attempting to remain below the radar, for there are spies everywhere in Gilead. Fear is the method of ensuring complete obedience, and death or exile is the punishment. The narrator's behaviour is guided by the dictates of the dystopian society, but her inner voice has a morality that fights everything she sees and does. In her first person narration, she records her attempt to walk a fine line between staying out of trouble and following her conscience. The repressive message of Gilead is to "blame the victim" and the indoctrination, isolation and lack of human connection allows the narrator to doubt herself even while feeling unsettled about what surrounds her. It is through her thoughts that she keeps alive her connection with the past, recalling the life she had before Gilead. Gilead is a theocracy, but the religious dogma is hollow. When religious rhetoric is used solely for political means, it loses its spiritual dimension and is just another empty tool of the powerful to gain more power. The religious observances in The Handmaid's Tale are hollow words, spoken only out of fear and conformity, never reflecting any true Christian teaching of compassion and forgiveness. So, Margaret Atwood is not condemning religion in this novel, but exploring how the rhetoric of religion can be used for the purpose of mass conformity. She is making a distinction between, for instance, the Quakers and the Baptists and the others who do not identify themselves as Christian who risk their own lives to save others, and go to great lengths to sacrifice themselves for others. The power in The Handmaid's Tale for me is in the exploration of the effects of the removal of all human interaction in a society. Individuals in Gilead are forbidden to look one another in the eye, to touch one other (except in specially sanctioned impersonal "ceremonies"), or to interact with anyone else on a personal level. What happens when this basic human need is denied? In small ways, the narrator sees evidence of the break down of the society, of cracks in the very foundation because of this inhuman condition. People are willing to take great risks to have these needs met. I loved this book. 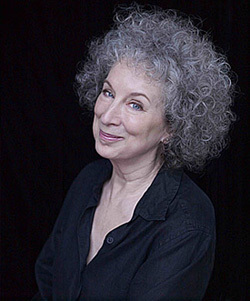 Every single time I read a book by Margaret Atwood I remember once again how much I enjoy her view of the world. Even when it is this dark and horrifying. This was my first Atwood and I loved it! Glad to hear you enjoyed it as well. i read this when i was in high school and it has stuck with ever since. loved it. think it was my first atwood book as well - definitely not my last. great post! "The power in The Handmaid's Tale for me is in the exploration of the effects of the removal of all human interaction in a society." You are so right about this, and it's actually a detail I hadn't really focused on when I read it (the first or second time).